Hello lovely ladies (and gents if you're out there). :) I hope you are having a fabulous week! Today I am participating in Bellarific Friday, and this week's theme is paper piecing. 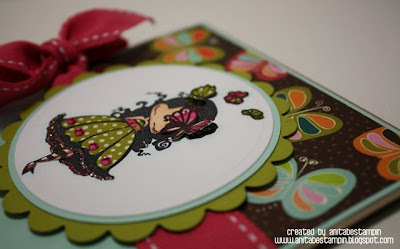 Check out more Bellarific Friday submissions at the Stamping Bella blog if you wish. The majority of this image is paper pieced, right down to the layered butterflies. All that paper piecing was a lot of work, but it was a lot of fun too. I had sort of forgotten how much I really like this technique...gotta love that! 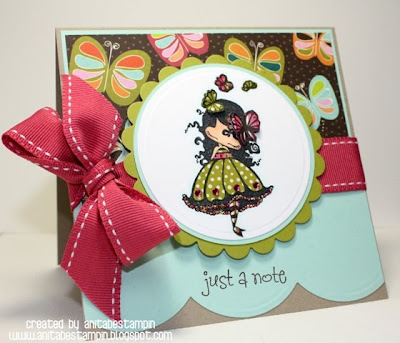 The Stamping Bella image used is Gertie from the Lulu collection, and the sentiment is also by Stamping Bella. Gertie was one of the nicknames used for me as a child, so it makes me smile to see that name. Ahhh...warm fuzzy. LOL Thanks so much for stopping by to check out my card today! Too stinking cute, gf! Love that big yummy bow and all the paper piecing too!